Looking for the Secret Menu? Looking for a hidden treat? Check out Fast Food Secret Menu Finder! 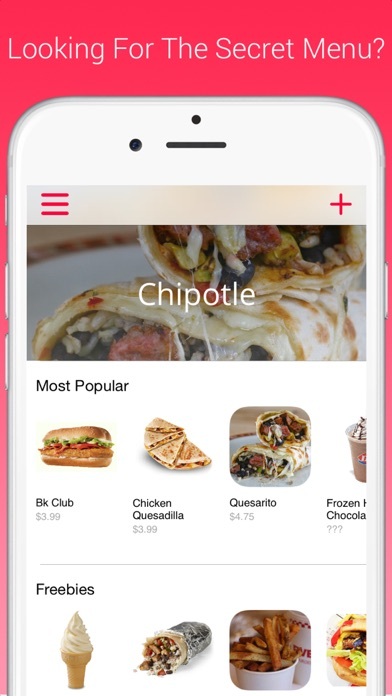 ~~~ TOP RATED MENU APP ~~~ $$$ VIP EARLY RELEASE SALE $$$ *** Usually $1.99, but FREE for TODAY ONLY *** Fast Food Secret Menu Finder is the best secret menu app! 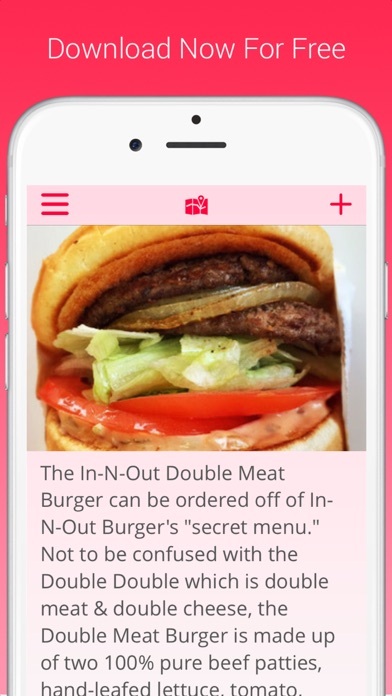 Find hidden and secret menu items and drinks at your favorite restaurants. Impress your friends and try something new! Find a new burger or try a new hot coffee recipe. ● Works at your favorite restaurants including ● McDonalds ● In-N-Out ● Starbucks ● Taco Bell ● Burger King ● Chick-Fil-A ● Chipotle ● Dairy Queen ● Five Guys ● Jack In The Box ● KFC ● Choose from over 100 different hidden items ● Get directions to your closest location ● Simple and easy-to-use layout. ● Direct-to-developer support Listen to what some of our users have said: ● "I can't believe I have never tried the Grilled Mustard Burger before, now it's my favorite" - Mike ● "My Starbucks order needed a little kick, so I tried the Cake Batter Frap. OMG!" - Katie ● "I use this app everytime I order. LOL" - Claire Fast Food Secret Menu Finder is translated to support the following languages Arabic, Dutch, English, Finnish, French, German, Greek, Indonesian, Italian, Japanese, Korean, Malay, Norwegian, Portuguese, Russian, Spanish, Swedish, Thai, Turkish, Vietnamese. Have a great idea or suggestion for Fast Food Secret Menu Finder? Send an email to support@wallyworldapps.com. 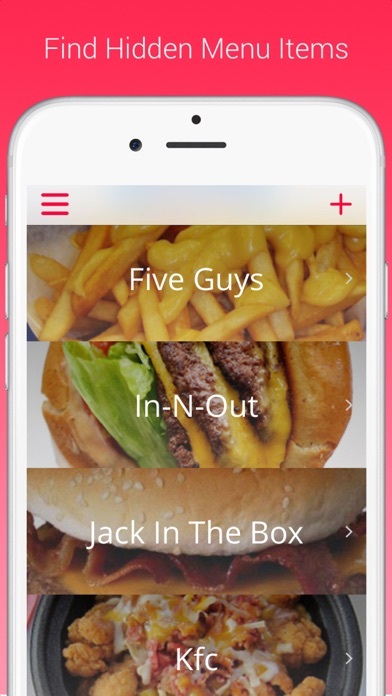 Your feedback helps drive the features that we will add to Fast Food Secret Menu Finder Thanks for checking out Fast Food Secret Menu Finder Check out the Screenshots and Download FREE Today Only. Possible Typo in the Restaurant Name!! Would give this zero stars but can't. Please don't waste your time. This is stuff you can find on the internet and there are so many ads! Good, but I know there's more. I know there's more places with secret menu items. Plus why is there 2 buttons for more apps? This app seems to be nothing more than an attempt to cash in on the fine app from App Ktchn Ltd (they even stole the logo design) by locking some of the content, constantly begging you to unlock it by getting the paid version, and assaulting you with some extremely frequent, intrusive, and unkillable ads. Avoid this affront to common decency like the plague and get the App Ktchn Ltd one instead, which not only has all the info available for free, and ad-free, it also has much better write-ups of each item as well. 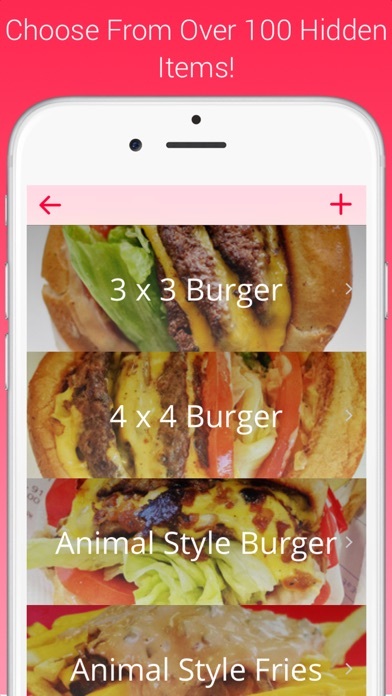 Like I mentioned earlier, the good app has the exact same burger and drink logo, but on a brown rounded square background. And no, I have no affiliation with App Ktchn Ltd except as a satisfied end user of their app. Loud Alarm Clock Free - Wake Up On Time!